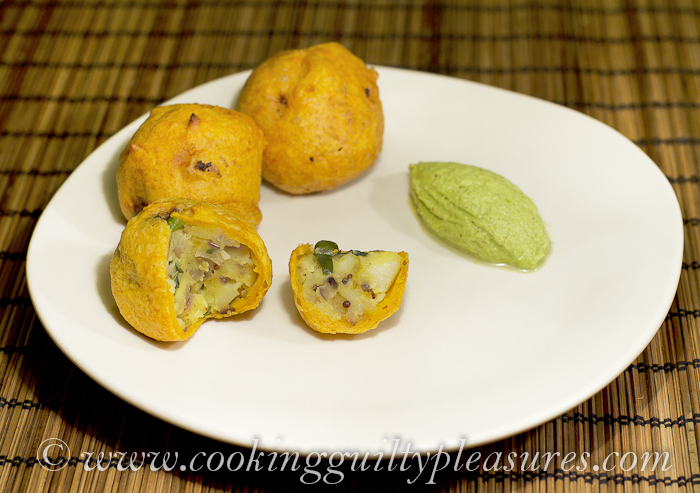 Aloo bonda alias Masala bonda alias Spiced Potato balls. Bajjis and Bondas are not part of my childhood memories. Don’t mistake it for being health conscious , the true blood carnivore that I am, was into chicken cutlets and meat samosas. I was sent away to a distant land to do my Bachelor Degree and those days spent in a hostel that served only vegetarian food forced me to look out for not so meaty yet tasty vegetarian options for the survival of my snacking habit. Biting into my first Aloo bajji, I must have blamed me for leaving myself devoid of those crunchy golden embodiments of taste for the long 17 years. There I was standing, over joyed at the discovery of a new found favourite. On busy evenings the regular bajji vendor of our hostel would save a few egg bondas and aloo bajjis for me and my friends and this meant we stayed as his loyal customers till the end. Many years later, I still drool over these little packets of comfort but this time there is no “canteen Anna” (that’s what we used to call the guy who owned the snack stall)to sell these straight from the hot bubbling oil. Hence, I have to satisfy myself with something that came from my kitchen. For the potato masala, heat oil in a pan. Add mustard seeds and let them pop. Add chopped onion, green chillies, ginger garlic paste, curry leaves , coriander leaves and sauté for about 3-4 minutes. Add turmeric powder followed by the mashed potatoes and sauté for another 2 minutes. Add salt , mix well and remove from the heat. Make sure the mix is dry to help with the shape of the balls. Prepare small lemon sized balls and keep them aside. For the batter, mix together all the ingredients listed under the section “For Batter” with enough water to make a thick smooth batter. Heat oil in a pan for deep frying the bondas, dip each potato ball in the batter ensuring its coated well on all sides and slide carefully into the hot oil. Fry on medium flame until the bonda is golden brown on all sides. Remove and drain on kitchen towels. Serve them hot with your favourite chutney, dip or the good ol’ tomato ketchup. I am sending this over to Radhika for the Deep fried Snacks event she is hosting.